Elvis Presley Lookalike Impersonator, Look-alike Impersonator Tribute Artist is Available for Shows, Parties, Conventions, Fairs,Cruises, Circus, Dances, Gospel Concerts, Events, Promotions anywhere in the U.S. and parts of Canada. Voted “BEST ELVIS Celebrity Lookalike, Lookalike Impersonator Tribute Artist” The Orlando Weekly Newspaper ” Best Local Performance Artist”Winter Wonderland Magazine. 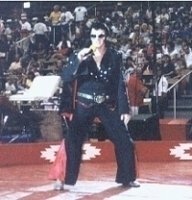 Elvis Presley Lookalike Impersonator Tribute Artist. 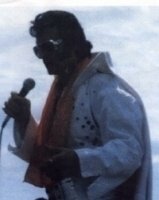 Invite Elvis Presley Look alike Impersonator to your next event. Great for meet and greet, photo opts. or a full stage show. 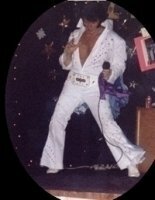 All of your guests will love Elvis Presley look alike Impersonator. 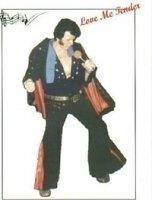 He is always a big hit with his hips swinging and his exact duplicate Elvis Presley outfits. He has a wonderful Elvis Presley voice and look. He sings all of the biggest classic Elvis Presley hits and wiggles all of his hips. He has lots of Elvis Presley costumes to choose from. His show will amaze and please your guests. he has never disappointed and is a real professional both in his look, voice and costumes. 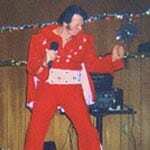 Elvis Presley look alike impersonator is ready to dance and sing at your next special event. He is available nationwide and also worldwide. Elvis has entered your building!